Summer is a great time to try new things! This summer, Formed Families Forward is getting tech-savvy and we invite you to join us. Our App of the Week features a technology tool that may be just the thing for you, your child, or the families you work with. Like us on Facebook and every week, a new App of the Week highlight will come to you! 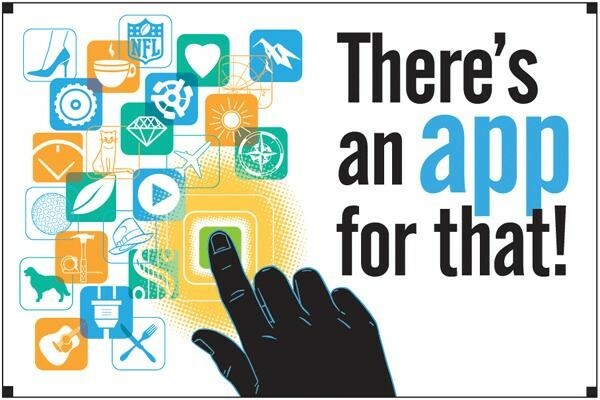 All featured apps can be found on the App of the Week webpage as well. Need a social story? Not sure what assistive technology is right for your child? Helping a new reader? Need resources for foster families, or just want to kill some time at the grocery store checkout? We have you covered with the Apps of the Week already featured this summer. Check them out here, and be sure to Like us on Facebook so you can get the newest Apps! foster, adoptive and kinship parents and caregivers on July 12 from 6:30 - 9 PM. Take a mid-summer break and join us for a relaxed evening discussion. Snacks served! We will only hold the event if we get enough interest 10 by July- so please RSVP. Who Cares about the Every Student Succeeds Act? Q: What is the big deal about this new federal law ESSA? I hear there is not much regarding children in special education, so why should I pay attention? A: The Every Student Succeeds Act (ESSA) is the latest version of the Elementary and Secondary Education Act, the largest federal education law that has been around since 1965. ESSA reauthorizes Title I to support low income schools and provides for other important civil rights and programs in public education. ESSA was signed into law in December 2015, and rules for implementing the new law are in process at the US Department of Education. Each state will submit plans for accountability and other provisions, and stakeholder input and participation is required. For formed families raising children and youth with disabilities, there are several aspects of the law that are designed to increase coordination of services and improve outcomes. ESSA authorizes only one alternate assessment to be used to assess a small group of students with the "most signficant cognitive disabilities" based on a State's alternate standards. State Title I Plans must describe the steps the State Education Agency (SEA) will take the ensure collaboration with the State department of social services to ensure the educational stability of children or youth in foster care. This reinforces provisions that have been in place since Fostering Connections Act, assuring that education agencies have reciprocal obligations, like social services agencies. Youth in foster care who need transportation to the school of origin promptly receive it in a cost effective manner and in accordance with the child welfare agency’s authority to use child welfare IV-E funding. Foster Care Transition Toolkit for foster youth, their fostering families, and agency workers. The Toolkit guides foster youth and young adults through goal-setting and planning for post-high school career and education, housing, health care, and much more. Additional great resources and videos about the impact of ESSA on students with disabilities and students in foster care are available from our friends at The Advocacy Institute. Step into the new school year on the right foot. 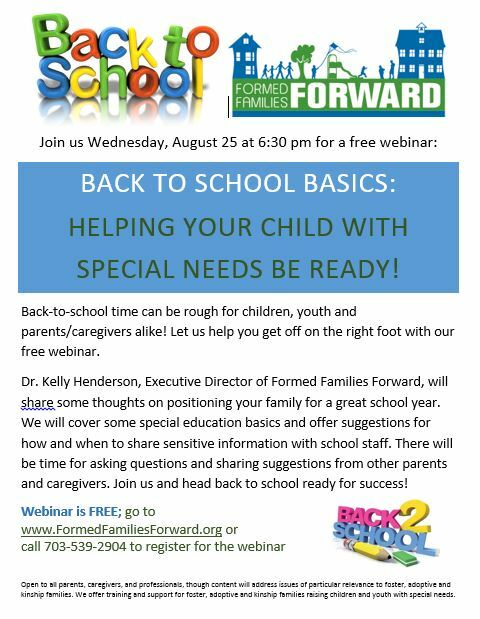 Whether you are back at it or fitting in a last trip to the beach, join us August 25 for a webinar full of tips and tricks for getting back into the school routine and setting your child up for success this coming school year. FREE and brief (no more than 90 minutes) - what could be better? REGISTER! 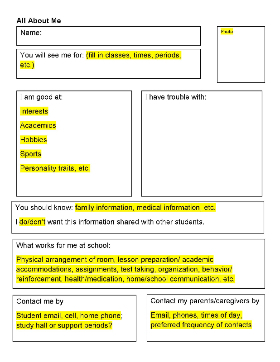 And don't forget our Formed Families favorite " All About Me" template for introducing the child in your care to his or her new teachers. Find the Template HERE and the Format Guide HERE. from Voices for Virginia's Children on July 20 at NVCC in Annandale. REGISTER. 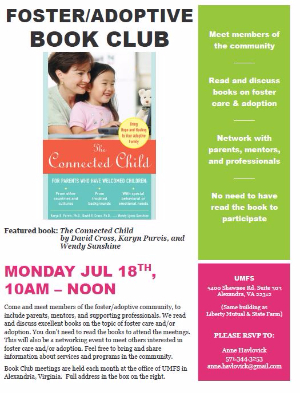 Monthly Foster/Adoptive Book Club meets July 18 at UMFS (note new room!). Featured book this month is The Connected Child by K. Purvis, D. Cross and W. Sunshine. Reading the book is not a requirement to attend!